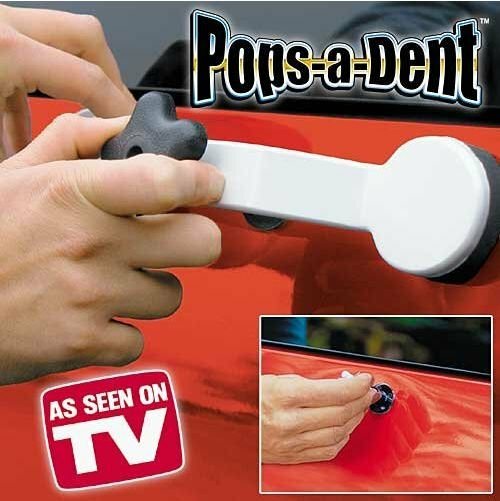 It’s simple to use, just three easy steps and Pops-A-Dent removes dents from hail. Car doors, shopping carts and more. Without damaging the surface of your car. Pops-A-Dent saves you time and money and is the economical alternative to costly dent professionals. Unique patent-pending arched bridge design eliminates the chance for additional damage. Other systems without our arched bridge design are known to actually add dents to a car! Patent-pending adhesive system design guarantees dent removal without the messy, sticky residue other systems are known to leave behind. Easily removes dents from hail. car doors, shopping carts and more without damaging the surface of your car.